The AGPtek A26 is an MP3 player that’s been regularly in Amazon’s “recommended” section. I recently purchased it along with 4 other MP3 players to see which one is the best in the $25 to $35 price range. The A26 has Bluetooth, something that none of the other MP3 players we purchased has at this price point. 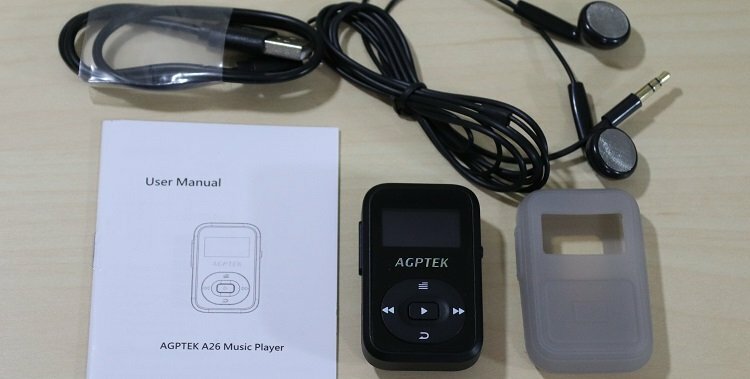 The AGPTEK looks like a promising MP3 player out of the box. It comes with a silicone case for sweat proofing, a USB to mini USB charger, instruction manual, and a pair of earbuds. These are your typical throwaway earbuds. If you’re buying this for yourself or for your child, it’s likely they’re not going to be comfortable enough to wear. The ear portion is wide and made of plastic and metal. While it’s sounds “ok” it hurts to wear over time. So, if you don’t already have a pair of earbuds and plan on purchasing this, expect to order another pair. The AGPtek has FM radio. This worked well for most channels inside and almost all outside. It did have static on occasion but overall was pretty good. AGPTEK also allows you to record radio with this device, something I didn’t feel was worth doing. The clip is a bit of a copycat design of the Sansa MP3 Jam player. It works perfectly well and I had no issues securing it during a run. The capacity here is enough for around 1,000 to 2,000 songs. That was enough for me personally, but you can also add a Micro SD card to expand capacity to up to 64GB. 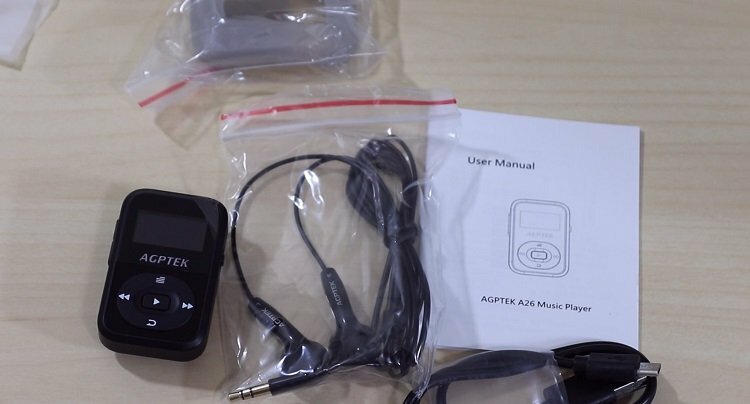 The menu of the AGPTEK A26 was much more intuitive than the other AGPTEK model we reviewed. I would say it was mediocre but not good overall. It occasionally paused between frames and took forever on the Bluetooth menu. Speaking of Bluetooth, I found this functionality to be almost useless. It was hard to connect, didn’t sound great, and didn’t always stay connected. If you’re buying this for Bluetooth, go elsewhere. Overall, the audio quality of this was very good. I tested this with a $10 pair of Panasonic earbuds that I used with all of the other MP3 players. I have no problem recommending this as an option. All of my audio files were supported. Most MP3 players today transfer kind of slow. This one was able to transfer around 75 songs (545MB) of data in around 2 minutes. That was consistent with every MP3 player I purchased. Most of them operate through USB 2.0 speeds. It was difficult to listen to audio books with this. It doesn’t play all of them and has trouble with certain formats. I wouldn’t purchase it for audiobooks. I really wanted to like this product. Not that I dislike it per say. It’s simply that the SanDisk Clip Jam does most of what it does in a way that’s smoother. The Bluetooth for this device is terrible, the menu is ok, and the audiobook listening options are limited. The Jam is only $5 more but is a much more polished product.